In flight from Beer Sheva to Haran, Jacob sleeps fitfully, with a stone for a pillow, dreams of angels going up and down a ladder to heaven, and has his first communication with the Lord, confirming the covenant. There are a variety of interpretations of the dream. Rashi thought the angels were just changing shifts. I came across three Hasidic interpretations. Here’s one: Levi Yitzhak of Berditchev suggests that the ladder represents how human beings can be planted in this world as corporeal beings yet be capable of reaching upward to enter into a relationship with the Lord. Further, the angels’ movement shows that the heavens are affected by our actions. 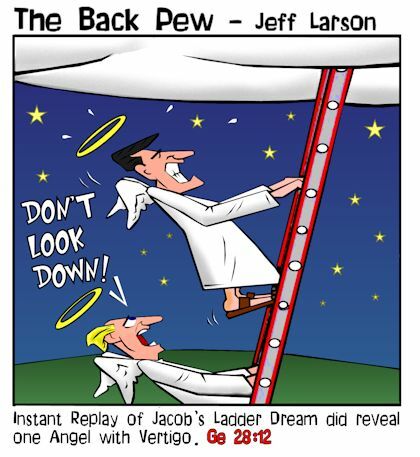 Sinning causes cosmic damage, “shrinking the heavenly hosts,” forcing the angels down the ladder; following the commandments effects a repair of the cosmos, sending angels back upstairs. Anyhow, Jacob meets his lovely cousin Rachel at a well (where else?) and is totally smitten. He uncovers the well, waters the flock, kisses her, and then introduces himself. They go on to Haran. Rachel’s father Laban, now head of the family, is disappointed at his nephew’s penniless state, remembering the riches Abraham had sent for Rebecca. Jacob offers to work 7 years for Rachel’s hand, “and they seemed to him but a few days because of his love for her.” (29:20) Laban tricks Jacob by switching brides, so that Jacob wakes up with her older sister, Leah. He is allowed to marry Rachel as well as long as he works another 7 years. The women are focused on childbearing, that being the path to increased status. Even though Rachel is Jacob’s true love, he has 6 sons and a daughter with Leah, 2 sons with Rachel’s maid Bilhah, and 2 sons with Leah’s maid Zilpah. At this point, Rachel has only one son, Joseph. Jacob continues to work for Laban, eventually learning how to protect himself; for example, Laban’s scheme to limit Jacob’s prosperity through specifying which flocks he could have is foiled by Jacob’s version of genetic engineering (30:29-43). But Jacob’s prosperity is too big an irritant for Laban and his sons, and Jacob finally takes his family away, after spending 20 years in Haran. When marrying an additional wife, consider not having pictures taken at the ceremony. This can be expensive, and in your case, incriminating. If you must have pictures taken, they should be displayed in a simple but tasteful frame, not, for example, in the newspaper. If you insist on submitting your wedding photo to a newspaper, it should not be your local newspaper, at least if your other wife reads the newspaper. I’d like to take five minutes to speak out against something else that is far too prevalent in contemporary America: monogamy. Not only is it nonsensical, counterintuitive, and counterproductive, it’s just plain un-American! The term monogamy comes from the Greek words monos, which means one or alone, and gamos, which means mind-numbingly dull. Historians believe that monogamy originated in the 8th century BC when a fiscally irresponsible camel-herder could only afford one gypsy girl for his harem. I say it’s high time we return to our Biblical roots. But if pleas from Biblical truth don’t do it for you, then choose polygamy out of compassion for humanity. Recent population studies report that females outnumber males on the planet 4 to 1. If that is the case, every man who only dates one woman is robbing three women somewhere of a date. My conscience can’t deal with that. Can yours? Would there be a market for genetic “factory seconds” and “irregulars”? I am blessed to be the mom to seven children. I find the best remedy for a hard day is a good laugh! I am always on the lookout for good, clean fun and jokes. And before you need to ask, yes, they are all mine, yes I do know what causes it, and yes, they are all cherished! You know where the bathroom is in any major store you visit. Your car has more seatbelts than windows. Your grocery budget is higher than your house payment. You do most of your thinking and praying in the bathroom. You no longer carry a purse, but use the diaper bag instead. You have a routine for stopping pacifiers, toilet training, cup training, and every childhood “phase”. You have so much laundry that when you finally get to the bottom of the pile, it’s actually stuck to the floor! You spend more money on diapers each month than you do on entertainment! Taking the kids grocery shopping with you makes you feel like a mother duck. When you see photos of castles and grand mansions, all you can think is how many bedrooms it has (YES! ), and how much space all those other rooms provide for the kids to mess up (NO WAY!). You know that every time you move the couch or couch cushions, you will find Cheerios under them…. Even if you have not had Cheerios in the house! When you go to order fast food, you order 6 hamburgers, one with ketchup only, one plain, one with no pickles or onions, two with no pickles, onions or mustard, and one with nothing but cheese, plus one fish sandwich, one chicken sandwich, one large hamburger, and one large hamburger with bacon. You then have to repeat yourself three times so the person at the window can get it right. You spend a lot of time looking at the little kids, urging them on to the next step, while still wishing they could stay little just a bit longer. When the many-times-handed down clothing is finally too worn out to hand down again, you still have a hard time letting it go because it has so many good memories attached. You can list at least three different technological advances in diaper design which you, personally, have used on your kids. This entry was posted in Uncategorized and tagged 7 years, Alan Dershowitz, Bilhah, deceit, Genesis, genetic engineering, Jacob, Jacob's ladder, justice, Laban, Leah, polygamy, Rachel, Zilpah. Bookmark the permalink.